"The Moringa health benefits have long since been well understood and cherished by the people of Asia and Africa. The tree’s uses as a health and medicinal plant can be traced back centuries; there are documented references of Moringa oil being placed in the tombs of ancient Egyptians. In fact, the tree’s benefits are so significant, it has been called the Tree of Life in many cultures. What the east has long since known is now being understood by the west, as more and more people in Europe and America begin to explore the benefits of alternative healing. Because the tree is rich in nutrients, and because the tree’s various parts can all be used, the many benefits vary depending on which part of the plant is being used. The young, immature Moringa oleifera pods are the most valued and widely used of all the tree parts. The pods are extremely nutritious, containing essential amino acids, forming a complete protein source, and many vitamins, minerals, co-enzymes, and antioxidants. * Mental and emotional balance - Moringa oleifera's amazingly powerful nutrient compounds help restore stability to the chemicals that govern our thoughts and emotions. You have to experience it to appreciate it! * Faster recovery - Moringa oleifera's complete amino profile, along with dozens of vitamins and minerals, makes it a perfect recovery food after grueling workouts and physical strain. * Nutrient-dense mother's milk - Increased iron, potassium, Vitamins A, B, C, E, and dozens of other important nutrients are all readily absorbed from Moringa oleifera and transferred from mother's milk to the growing newborn. No wonder Moringa is called 'Mother's Best Friend' in cultures across Africa! * Healthy blood sugar levels - antioxidants and unique regulating compounds help control blood sugar and keep the blood free of unhealthy substances. Just a few of the other many benefits of Moringa oleifera include increased flexibility, improved sensory perception, better sleep cycles, decreased depression and anxiety, and improved memory. Moringa has been used to help those with diabetes, arthritis, high blood pressure, and even cancer. Highly valued Moringa oil is extracted from the pods, and even the remaining seed cake does not go to waste. The seed cake can be used as a coagulant to clarify dirty and turbid water. It is used as an effective means of removing sediment and bacteria from water, helping to purify and treat water naturally, a useful benefit in areas where industrial water treatment is not available. 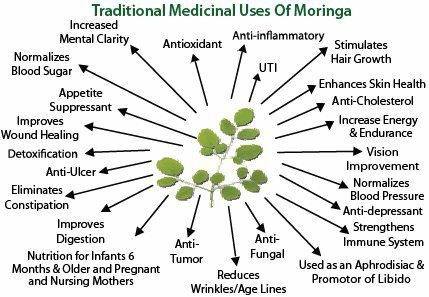 Moringa leaves are perhaps equally valuable and provide powerful benefits to anyone who is conscious of their nutrient intake. The leaves of the Moringa tree are among the most protein-dense leaves of any plant species. Moringa leaves also contain high levels of vitamin A comparable to carrots, calcium comparable to milk, and vitamin C comparable to oranges, as well as high amounts of other vitamins, antioxidants, and minerals. Unlike factory produced synthesized pills, the Moringa leaf is crushed and inserted directly into a capsule, retaining all its nutritive value. Moringa leaves can be used in food preparation, and also brewed as a tea, either alone or in combination with other teas. Even a small glass of Moringa tea benefits the drinker with a host of nutrients. It is impossible to list the complete benefits of Moringa, simply because they are too numerous to write out. What is guaranteed is that our Moringa Products are freshly produced and packed to retain their nutrients. They are safe to consume by all ages, and will benefit you and your family for years to come. Choose Moringa Source for your Moringa and discover the many benefits in store for you!